Pope Francis’ approach to diplomatic issues is pragmatic and is aimed at achieving immediate outcomes that are less attentive to theological issues. He pursues a diplomacy of prayer, of the Holy Door, of mercy, but also a diplomacy with doctrinal-theological concessions, all in the interest of the “culture of the encounter” to which he earnestly reaches out. This “culture of the encounter” is characterized by the four principles outlined in the Apostolic Exhortation “Evangelii Gaudium.” The most important of these principles is that “realities are more than ideas.” It seems, in the end, that Vatican Ostpolitik is back again. A long-standing diplomat and Secretary of State during the first decade of John Paul II’s pontificate, Cardinal Agostino Casaroli initiated his brand of Ostpolitik on September 15, 1964, when – in his capacity as “Vatican vice Foreign Minister”, post then named “undersecretary of the Congregation for the Extraordinary Ecclesiastical Affairs” – he went to Budapest to sign an agreement with the Hungarian government. It was the first of a series of agreements between the Holy See and the Communist regimes in the East. One of the sacrifices involved in negotiations was silence regarding the persecuted Churches and their persecutors. The dilemma was whether to resist or negotiate. That is, with keeping firm positions or accepting compromises in order to make some step forward. In the end, it was all about pursuing an ideal or carrying forward a realpolitik, with all the risks involved in it. Pope Francis’ notion that “realities are more important than ideas” is proved by his “realpolitik approach” that he applies to both diplomatic and religious issues. 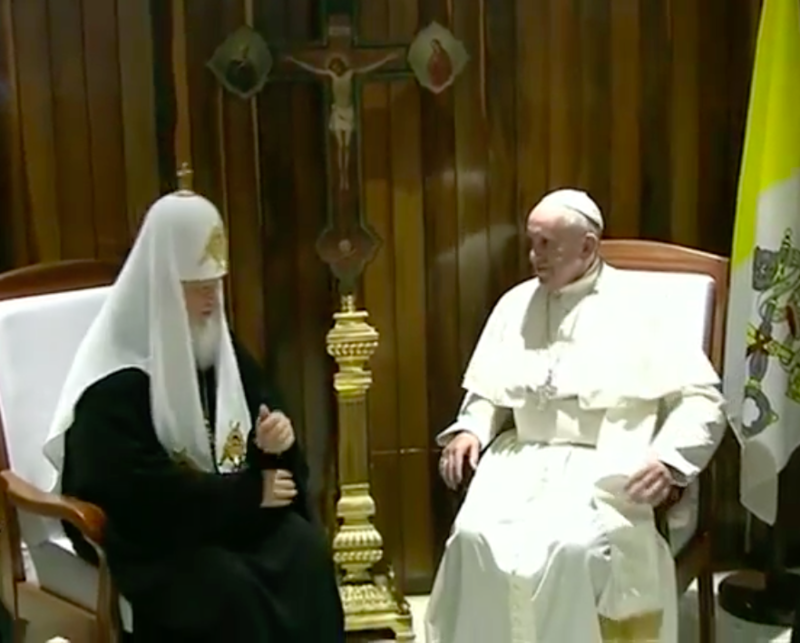 For this reason, the first meeting in history of a Pope with a Russian Orthodox Patriarch was not an ecumenical meeting. The Russian party took care to warn that all the issues among the two Christian confessions – both theological and ecclesiastical – still hold, and that the meeting is mostly intended to speak with one voice on the issue of persecuted Christians. Perhaps we could expect more of such a premiere. Popes have been trying to start a dialogue with Moscow for many years. But Moscow has always hedged either because of internal issues (there remains a part of Russian Orthodoxy profoundly set against not only a dialogue, but even a meeting) or because of issues of ecclesiastical politics. The Russian Orthodox did not even take part in the drafting of the document of Ravenna in 2007, the last of the theological documents of the joint Catholic-Orthodox Commission to have accomplished a serious ecumenical step forward. The Russians also walked out of the assembly to protest the invitation of the Estonian Orthodox Church, which Moscow did not acknowledge. The issue of ecumenical dialogue turned even more political when conflict broke out in the Ukraine. During the 2014 Synod, Metropolitan Hilarion, head of the Russian Patriarchate’s Department for External Relations, could not restrain himself from making a strong attack against the Ukrainian Greek Catholic Church, accused of plotting to steal parishes away from Russian Orthodoxy. The attack was so severe that Cardinal Timothy Dolan, Archbishop of New York, immediately hosted Major Archbishop Sviatoslav Shevchuk on his radio show in order to counter such a narrative. Archbishop Shevchuk noted that Pope Francis was “timid” in the face of this Russian aggression, and criticized the fact that the Pope had labeled the conflict in the Ukraine a “fratricidal war.” There is some coldness toward the Francis-Kirill meeting on the part of the Greek Catholic Church in the Ukraine, the largest of the Eastern Catholic Churches which were previously Orthodox – in fact, the Greek Catholic Church became forcibly Orthodox after the 1946 pseudo-Synod in Lviv, and then returned to the Catholic Church after the collapse of the Communist regime. For his part, Patriarch Kirill achieved many goals. First, he will claim to take part in the Great and Holy Pan-Orthodox Synod in Crete with the same weight and prestige of Bartholomew I, Patriarch of Constantinople, who organized and promoted the Synod and who proved to be the privileged Orthodox interlocutor with the Holy See (and with popes in particular) in the course of these last years. Secondly, he will show that Russia is not isolated anymore in the diplomatic field, thus being a sort of de facto Shadow Minister for Foreign Affairs for the Kremlin; and thirdly, he will give a signal of his importance to all the other Orthodox Churches, and also to the Greek Catholic Church in the Ukraine – the mentions to the Ukrainian issue in the final joint declaration are somewhat imbalanced toward Moscow Patriarchate’s claim. Why did Pope Francis agree to a meeting in Cuba, a place that is formally neutral but in fact still imbued with a Soviet-style Communism? Why did he agree to the meeting despite the fact that there will not even be a moment of common prayer, meaning that the meeting has no ecumenical character? He did so by following the principle that “realities are more important than ideas.” A meeting in a neutral territory had been planned for years. In 1997, in Graz (Austria), the meeting between John Paul II and the then patriarch Alexy II was already planned, but it did not take place. Twice under Benedict XVI a meeting between the Pope and the Patriarch was close to taking place: once during the Pope’s trip to Croatia and another time in Bari where the Pope went for the National Eucharistic Congress. Both of these places were considered emblematically as a bridge between East and West, and for this reason fit for a new season of theological dialogue. This dialogue was intended to arrive at a real ecumenism and to overcome theologically the division among Christian Churches. Now Pope Francis agrees to an historical meeting, first, in order to initiate a path. It is a choice of realpolitik rather than ecumenism. In fact, a concrete ecumenical achievement would involve a papal trip to Moscow, one in which the Pope would also speak to that minority of 1 million Russian Catholics. But Moscow is apparently still a dream for popes. Beijing, however, may not be just a dream anymore. Here, too, however, the Holy See’s effort has been characterized by a certain realpolitik. After the 2007 letter which Benedict XVI addressed to Catholics in China, relations with Beijing fluctuated. A series of episcopal ordinations took place which met the joint approval of the Chinese government and the Holy See. But then the Chinese authorities appointed some bishops on its own. In addition, other priests and bishops were imprisoned. The picture was not clear for the Church in China, whose underground part does not live in ideal times. How can the underground Church get out of the catacombs? One of the ideas on the table is that Pope Francis should appoint bishops from a roster proposed by (or at least acceptable to) the Beijing administration. This way, it would be easier to secure the joint approval of the Chinese government, and thus – step by step – to regularize those priests and bishops that the Chinese administration still considers clandestine. The approach, in general terms, might create some problems. Until now, the bishops appointed with joint approval had been chosen by the Holy See, because only the Pope can appoint bishops. In some cases, particular Chinese objections were taken into consideration. But in the end, it was the Holy See’s choice. The Holy See did not have to deal in any way with an external (and politically composed) body proposing the names of possible bishops. Can the wound of the underground Church in China really be healed this way? Certainly, China has a great wish to open to the world. As Russia needs to get out of its diplomatic isolation (not by chance, President Vladimir Putin went to visit the Pope in Rome twice in three years), so too China needs to show the world another side of its face. The turnabout took place after the election of the new president, Xi Jinping, an election that came shortly after Pope Francis’ election. The new president made the decision to give China an international platform by portraying it as more open to dialogue with other nations and more tolerant in terms of religious freedom. The new Chinese spring – although with its shadows – showed its face when the celebration for the opening of the Holy Door took place without any arrest, despite the fact that the crowd was completely composed of people belonging to the underground Church. The possibility of an “informal” papal opening to bishops illicitly ordained in China was provided by the same year of mercy. Missionaries of mercy have a mandate to absolve sins reserved to the Apostolic See (although this terminology is not used with the new Canon Law Code of 1983). What are these sins? The sins are: the profanation of the Eucharist, violence against the Pope, absolution of the accomplice in sins against the sixth commandment, a confessor’s violation of the sacramental seal, and the ordination of a bishop without a pontifical mandate. According to the letter sent by Archbishop Rino Fisichella to missionaries of mercy, only this last sin cannot be absolved by the missionaries of mercy. So, the possibility that an illicitly ordained bishop might be absolved and then re-enter in communion with Rome was cut out. However, this possibility was never truly there, since valid absolution of any sin requires the conversion and repentance of the sinner. How could a bishop illicitly ordained be allowed to exercise his ministry under these circumstances? Perhaps this is one of the problems that brought the Pope to clarify to these missionaries which sins they could actually absolve. Considering, then, the whole range of sanctions concerning, for example, the sins of schism, apostasy, or the concelebration of a Mass with an Anglican minister, sins which could fall under the umbrella of sins able to be absolved by the missionaries of mercy, it is remarkable that no mention of them was provided. Beyond this, the border with Beijing seems about to be opened. Setting aside concerns over religious freedom, Pope Francis might find an agreement with the government for a trip to China, since Beijing needs a gesture of opening to be finally considered a world power, with a strong economy and at the same time a sensitivity to human rights, a matter about which the international community cares. Realpolitik prevailed also in relations with Turkey. During the April 12 celebration with Armenians to commemorate “the great evil,” Pope Francis described the massacre of Armenians as a “genocide”, quoting – but the quote was not made explicit during his speech – a 2000 joint declaration between St. John Paul II and the Catholicos Karekin. The declaration resulted in a freeze in diplomatic relations with Ankara, which recalled its ambassador to the Holy See. Ambassador Mehmet Paci returned to Rome last February 4, after the Holy See finally referred to the massacre of Armenians as “1915’s tragic facts”, avoiding the word “genocide.” The mention came out in a press release delivered February 3, after Rinaldo Marmara, cultural attaché to the Turkish Bishops Conference, presented to Pope Francis a book (“La squadra pontificia ai Dardanelli”) filled with documents from the Vatican Secret Archives. The Holy See needed renewed diplomatic relations with Ankara because of Pope Francis’ wish to visit Armenia. But Turkey was crucial also for the organization of other possible international trips. The Prefecture for the Pontifical Household’s schedule reads that this coming Angelus on May 22 has been cancelled, and immediately the possibility of a one-day papal trip to Kosovo, to visit refugee camps, emerged. According to sources, the trip was almost organized, but it will not take place. It is possible that difficulties in preparing it were also influenced by the bad relations with Turkey, the point from which refugees move to Greece, Macedonia and Kosovo in order to enter into the European Union. There was another hole in the papal agenda, between June 22 and 26, and every clue led to a possible trip to Armenia (and Georgia), as Cardinal Leonardo Sandri, Prefect of the Congregation of the Eastern Churches, led observers to understand during his trip to Armenia last September. But a trip to Armenia can be postponed, possibly until September, allowing Pope Francis to go in June to an even farther outward post, perhaps Azerbaijan. Behind all of these diplomatic moves there lurks the precise thinking behind realpolitik, which borrows many of its principles from Cardinal Agostino Casaroli’s “Ostpolitik”. This “realpolitik” meets Pope Francis’ need to show his closeness to non-Christian places and the Secretariat of State’s need to be a well-considered international player. Not by chance, all of Cardinal Pietro Parolin’s proposals for reform aim at showing the Holy See’s diplomatic muscle, beyond whatever pastoral work it accomplishes. In the matter of the thaw in Cuban-US relations, the Holy See worked as a facilitator, after an invitation to do so by the two parties. Cardinal Parolin has even proposed the establishment of an office for mediation in the Secretariat of State in order to tackle more attentively these issues. The Cardinal always emphasizes the Secretariat of State’s diplomatic role. Realpolitik has been the Secretariat of State’s criterion to manage the internal reform of the Curia. During the last meeting of the Council of Cardinals, a reform of the Secretariat of State was discussed. This development was somewhat surprising. At the outset, the Secretariat of State was supposed to be dismantled. Then Cardinal Parolin regained influence. But now, the possibility of a reform is on the table again. Nevertheless, it remains to be seen what shape an eventual reform of the Secretariat of State will take. Certainly, the Secretariat of State encouraged a pragmatic approach to diplomatic problems. Pope Francis has shown appreciation for it. But rejected by John Paul II, and set aside by Benedict XVI’s diplomacy of truth, Ostpolitik is now back in vogue in the Vatican. It will certainly achieve some immediate goal, and it will be successful in secular terms. But will it be successful in theological terms? The US is a reluctant global superpower Russia is a major European and Asian power with a world-wide vision. The Vatican is a global soft power. Thus, Pope Francis’ pro-active Vatican diplomacy, in this critical context, is objectively constructive, particularly if the conflicts in the Middle East, central Europe and the global economy continue to intensify. Thank you for your articles but I must admit I often find them too cryptic and vague. Of what would or do “doctrinal-theological concessions” consist? Can you give some examples, please? Why do you think a pope would prefer to give them in the interests of dialogue? Dialogue to what end? If the end is the truth, why compromise that truth in the interests of dialogue? Is the idea to start the dialogue and then (re)introduce truth later as the end goal? Or is the end goal not the truth? Then what is it? This makes it sounds like we are dealing with very earthly goals and personal desires. Again, fine to raise it (and I suspect you may be right), but don’t you need to develop this to the logical conclusion? You ask a good question at the end but please do not stop there. The question is surely if the theological goal is even there anymore. So, what do you think is the end goal? Hi! Thanks for writing. I will try to give a response to all of your questions. First of all, the doctrinal-theological concessions. Take, for example, the dialogue with the Lutherans. He will go to Lund Oct. 31, for the commemoration of the Reformation. Lutherans might take this gesture as a sort of acknowledge of the schism. He could even try to pursue the theological dialogue, more than giving a presence. 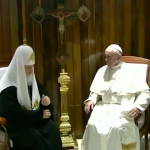 But, as he said during the meeting with Kirill, he thinks that “ecumenism is made by walking”. That means that theology is on a second level. So, the Pope does not care if Lutherans might take his presence as a sort of backing of the Reformation. He just goes. This is a doctrinal concession. A doctrinal concession is also meeting the patriarch Kirill for a meeting that “it is pastoral”, always in Pope Francis’ words. Despite the fact that the final declaration had many non pastoral things – the appeals to the international community, for example – saying that the declaration is pastoral freezes the theological dialogue. It is on a second level. But, if the final aim is to reaching out for truth, and if you believe that what you believe is truth, you don’t just go and accept to meet without any well grounded dialogue. Pope Francis does. He is very Jesuit in this. He goes beyond Christianity, and – yes – I believe he thinks that truth might be (re)introduced later in the dialogue. How much this will work, I cannot assess. I am quite skeptical, but I am not a fortune teller, I cannot foresee the future. I don’t have any conclusion to this. I don’t see the theological goal there anymore, and I could find many clue of that (if you read to my pieces backwards, you will find many mentions about that). But I don’t know if the outcomes will be good or not. I can just identify the trends. Thank you for taking the time to reply to me. It was as I suspected it might be – unfortunately, it means that things are very, very bleak. Poor Pope Benedict must be suffering so much to see the wolves roaming triumphant – for now. Perhaps we are not fasting and praying enough this Lent. May God bless you for your important work. Thanks for taking your time to read. I know that sometimes things are not as clear as I think, and a good feedback helps me to clarify. God’s plan are always bigger than us. So, let’s be optimistic, despite any circumstance. I just make a snapshot of what I see, then things may be different or change.